Office Hours (Spring 2019): T 2-3, R 10:30-11:30 and by appointment. I'm originally from Indianapolis, Indiana and grew up there and abroad. I did my undergraduate work at Yale before moving on to Cornell for my PhD (with visiting semesters at Corpus Christi College, Oxford and the University of Konstanz). I then spent a happy year in Munich at the Thesaurus Linguae Latinae, where I wrote dictionary entries for a number of Latin words beginning with the letter P. After that I taught for a couple of years at the University of Illinois, and since 1999 have been in the Department of Classics at the University of Virginia. I regularly teach undergraduate lecture courses on Roman Civilization and Mythology. Smaller upper-level and graduate courses have included Homer, Greek lyric poetry, the Greek Novel, Petronius, Lucan, Statius, the Latin letter, Latin declamation, Apuleius, and St. Augustine's Confessions. I teach Medieval Latin (at the undergraduate level) in alternate years; other semi-regular courses are Latin Palaeography and the department's graduate Latin literature survey. In recent fall semesters I have taught a one-credit first-year seminar on Edgar Allan Poe. This year I'm teaching one on Umberto Eco's The Name of the Rose. My research centers on late and medieval Latin, especially the North African allegorist Fulgentius, whose works I'm editing and translating. I'm also working on a book-length project on the survival and reception of medieval manuscripts from the fifteenth century to the present. I have a continuing interest in Greek epic and lyric poetry and its reception in later writers, especially the American and European modernist movements. 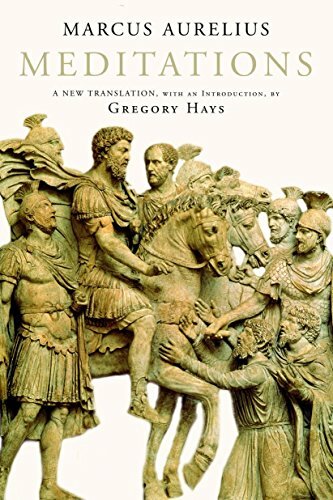 I translated Marcus Aurelius's Meditations for the Modern Library back in 2002. I'm on the editorial boards of the Toronto Medieval Latin Texts series and the Dumbarton Oaks Medieval Library. Click here for a list of recent publications and conference papers. You can now follow me on Twitter @aristofontes. ... along with some more frivolous ones. (c) 2018 by Gregory Hays. All rights reserved.